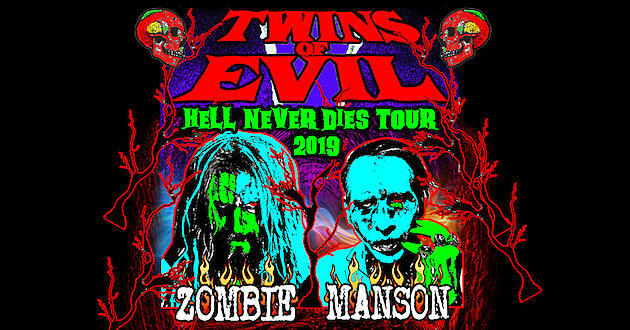 Rob Zombie and Marilyn Manson have expanded their summer North American “Twins Of Evil” tour with the addition of two new concert dates. Set to begin July 9 in Baltimore, MD, the six-week co-headlining series will now include an August 2 stop at the Moda Center in Portland, OR and an August 3 show at the White River Amphitheatre in Auburn, WA. Presales are underway now for both dates, with general public tickets going on sale Friday, March 29 @ 10:00 am PDT. Originally announced last month, the summer trek features appearances at two festivals in Wisconsin, including Rock USA in Oshkosh and Rock Fest in Cadott. “We had been talking about doing something together for these shows, that he should come onstage during my set and we’d do a song,” revealed Zombie last summer, “But we couldn’t think of what song. After we talked, later that night I was home and I just thought, The obvious song is ‘Helter Skelter’… It’s so obvious that neither one of us thought of it! Ahead of the summer tour, Zombie will play a series of US dates in May before a month-long run of Europe – including an appearance at the UK’s Download Festival. 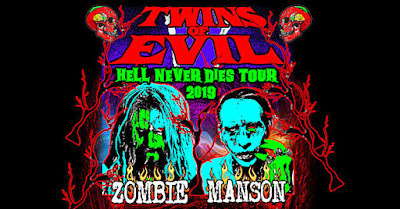 "Twins Of Evil – Hell Never Dies"